Welcome to Vol. 4 Issue 2 of the VOX-Pol Newsletter. 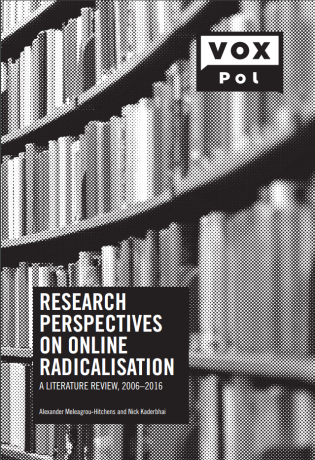 VOX-Pol launched its third report ‘Research Perspectives on Online Radicalisation’ on 3 May 2017. The literature review, co-authored by Alexander Meleagrou-Hitchens and Nick Kaderbhai, seeks to recalibrate our understanding of online radicalisation, how it is conceptualised within the literature, and the extent to which the policy debate has advanced in response to technological and legal developments. Our next VOX-Pol workshop, ‘Comparative Approaches to Understanding Violent and Non-Violent Online Extremism’, will take place on 22 May, 2017 in University College London. The workshop will focus on the main debates, issues, achievements, gaps, and methodological challenges in research on (non-)violent online political extremism and online radicalisation, but also encourage constructive dialogue and cross-pollination across different disciplines and case studies. More information, including confirmed speakers, is available HERE. There is no registration charge for this event. Please contact workshop@voxpol.eu to register. VOX-Pol’s second Training Academy, a week-long event dedicated to exploring various topics at the nexus of violent extremism, terrorism, and the Internet, will be held this Autumn; precise dates and location to be confirmed shortly. Participants should be professionally tasked in the area of violent online political extremism, including, for example, law enforcement officials, policymakers, social media company representatives, etc. The first Training Academy, held in September 2015, included topics such as history of violent online political extremism; in-depth studies of types of violent extremisms, including the far-right, violent jihadis and lone-actors; ethics and politics of monitoring violent political extremist content online, and more. For further details on the content of the previous Training Academy, see HERE. Additional information will be published on our website as soon as it becomes available. If you would like to register your interest in advance, please contact trainingacademy@voxpol.eu. VOX-Pol Programme Manager, Lisa McInerney, participated in the EU Radicalisation Awareness Network’s (RAN) Civil Society Empowerment Programme’s kick-off workshop in Brussels on 15 – 16 March, 2017. The Civil Society Empowerment Programme (CSEP) is an initiative by the European Commission with the support of partners in the Internet industry, including Facebook, Twitter, Google, and Microsoft. Lisa’s contribution was part of a scene-setting panel regarding the current state-of-play of violent online political extremism. On 30 – 31 March VOX-Pol and CEU’s Kate Coyer participated in RightsCon Brussels 2017. Dr. Coyer participated in a panel titled ‘Trump, Brexit and the Future of Digital Rights’, presenting VOX-Pol work regarding the challenges of social media companies moderating violent extremist content online in the context of media development and the digital rights agenda. Co-author of our latest report, Dr. Alexander Meleagrou-Hitchens, formerly of ICSR, together with his George Washington University Program on Extremism colleague, Seamus Hughes authored the article ‘The Threat to the United States from the Islamic State’s Virtual Entrepreneurs,‘ which appears in Vol. 10, Issue 3 of the CTC Sentinel. The article focuses on IS’s “virtual entrepreneurs” who have been using social media and encryption applications to correspond with and recruit sympathisers in the West, encouraging and directing them to engage in terrorist activity. They found that since 2014, contact with a virtual entrepreneur has been a feature of eight terrorist plots in the United States. VOX-Pol Research Fellow Caterina Froio was interviewed by Sciences Po for an article titled ‘Are Far Right Parties a Threat to the European Union’. The article is available HERE. Dr. Kate Coyer was interviewed for a USA Today article on the online presence of violent extremists, which is available HERE. Dr. Coyer was also quoted in WIRED’s article on Germany’s plan to fight hate speech online, available HERE. Dr. Paul Gill was quoted in Hadley Freeman’s op-ed on lone actors and domestic violence that appeared in The Guardian, as well as in Huffington Post’s article on the same topic.